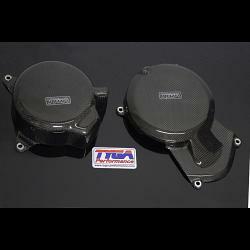 This engine protective cover set is made from lightweight carbon with an abrasion resistant inner layer of Kevlar. Now requirement for many racing classes and a sensible and attractive addition to a road bike. Note: This set does not fit the 2014-2015 model, Duke 250/390 KTM RC250/390 due to a revised design of the left side engine cover.